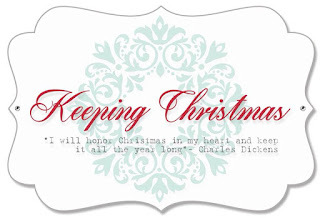 It's time for this month's installment of Keeping Christmas with The Challenge design team! I turned a non-holiday stamp into a holiday image for my cute design. The focal image is a deer from the Paper Smooches Happy Camper set. With the addition of a red enamel dot "nose," the set's deer image transforms into the perfect reindeer! I used foam tape to adhere the colored image to a light blue panel embossed with a snowflake pattern. The raised flakes were brushed with a shimmery white ink pad to highlight them. I added a strip of shimmery white cardstock with a torn edge beneath the deer to ground the image, then adhered the panel to contrasting navy blue cardstock strip. I matted the strip on a piece of sparkly silver cardstock and positioned it on the left side of a light blue card base. 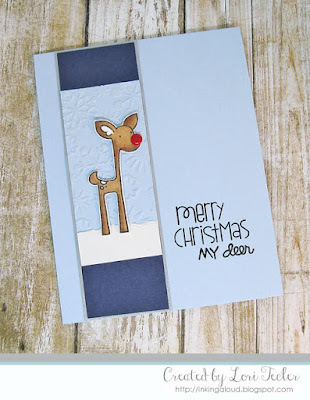 I combined sentiments from the Christmas Sampler and the Happy Camper sets to come up with the "Merry Christmas my deer" sentiment. What a cute card! That image is adorable! LOVE!!! Too darn cute...just love your sweet reindeer, simply adorable!